You need some monopod advice, but you're wondering where to get it. There's plenty of general advice on how to use a camera monopod, as well specific advice on using monopods for video, with heavy lenses, and the best monopod you should use for wildlife and bird photography. These specific tips can come from a variety of sources. 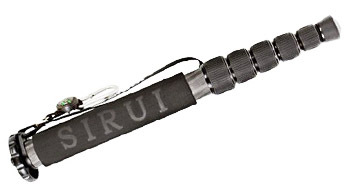 It's important to read the articles on monopods that pertain to how you're going to use yours. Photographers preferences with monopods will vary as much as their preferences for camera brands and accessories. I've purposely posted over 50 articles relating to camera monopods and you can find the index here. If you're looking for advice on buying a monopod, it's a good idea to check out several monopod reviews on any given monopod you are investigating. Pay attention to the issues that are brought up. If the issues don't apply to your own specific situation, you can ignore them. 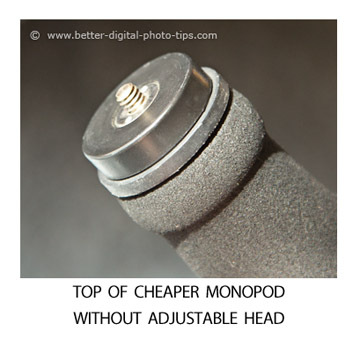 The head you attach to the top of your monopod affects it's performance more than anything else and it's a topic many forget to explore as part of the process of evaluating a particular monopod. 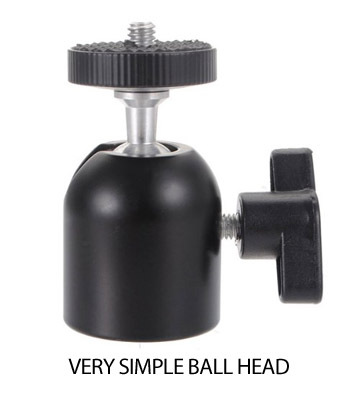 Some photographers downplay the use of an adjustable head. I don't. That might be a valid opposition if we were only shooting in a two dimensional world. 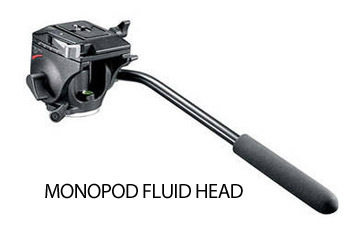 Most commonly used on monopods are ball heads or fluid heads. We live in a three dimensional world of changing angles, twists, leans, tilts, and rotations. Of course, you can rotate the monopod shaft itself. This movement is great for moving targets like wildlife, race cars, or other similar sporting events where the action is only side to side with no vertical component. If that is the only type of photography you are doing with your monopod, you can get away with not using an adjustable head. This video on monopods does a good job of showing the benefits of having a fluid head attached. The only time I shoot with a monopod that doesn't have an adjustable head attached is when I am shooting everything at eye-level, which is not too often. The biggest complaint about monopods is the plastic collar that surround and holds the mounting screw. With cheaper monopods you run the risk of having this breaking, your camera falling off , or even that mounting screw getting stuck in your camera with no practical way to remove it. This type of monopod is okay for a light, simple point and shoot camera but extra care should be taken to only screw it on somewhat snugly and treat it gently. Read several monopod reviews first. 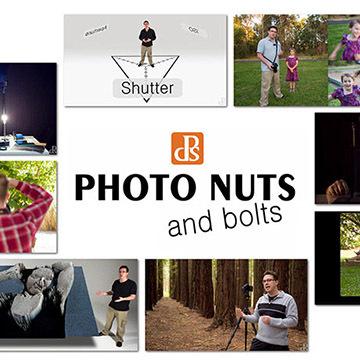 Rather than read the marketing materials directly from a monopod manufacturer like Manfrotto or Benro, learn what other photographers users have discovered through their purchases. The way our minds work, we sometimes have preconceived notions and then go out and seek information that supports it. Getting opinions and reviews from shooters with other perspectives is a great way to gather relevant information and make better monopod buying decisions. The best monopods for video have a fluid head and small retractable feet. The video below shows the advantages of having these valuable features as part of the basic video monopod. Fluid heads give you a great way to SMOOTHLY add tilting, panning, and controlled zooming motion into your videos. The retractable feet add stability and hold-ability to your video camera. 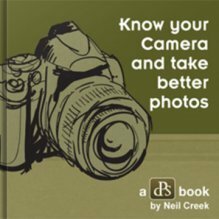 I don't know if you can anoint me as an Amazon expert, but I can tell you that my family and I have been purchasing quite a large variety of things from Amazon over the years, including camera equipment and accessories. 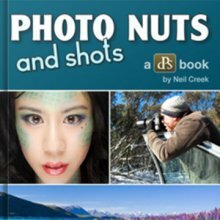 From Amazon we have purchased razor blades, humidifier filters, triathlon shorts, running shoes, fireproof safe, external hard drive for backing up my photographs, a lot of books, nutritional supplements, and..... well, you get the idea by now. Because of advances in image stabilization technologies and better high ISO performance, the demand for monopods has gone down dramatically and I think that it's unfortunate. This is particularly more true with still photography than video. Monopods are extremely valuable for shooting better videos with a few simple techniques. Here is a good video to stimulate some thinking on your part. My best monopod advice is to read the related articles on monopods to get a good feel of everything there is to consider. You can use the search box here or go to the Monopod Reviews articles for all of the related articles. That link is at the end of this article.